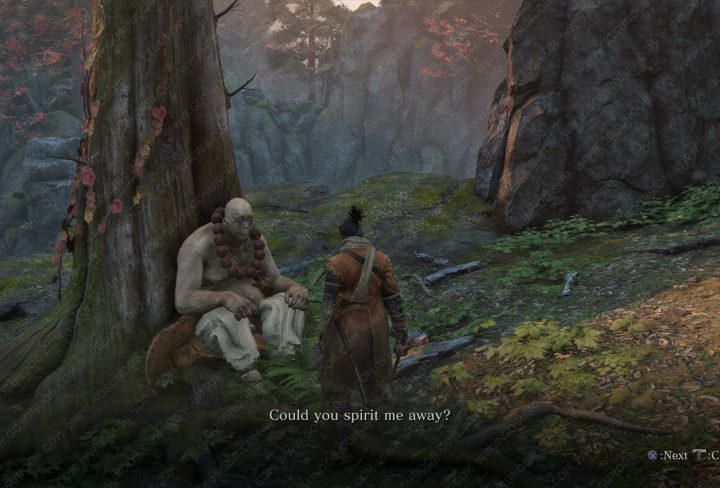 Kotaro is an NPC you will come across as soon as you enter the Senpou Temple region in Sekiro. Big lug is to the right of the Senpou Temple, Mt. Kongo Sculptor’s Idol. He is feeling lonely since everyone left him behind and is desperately asking you to find him a pure white flower. Resolving his destiny and finishing his quest can be done in several ways. The way you handle it also impacts the ending of the game. This makes Kotaro very important. We’ll tell you where to find the white flower in Senpua Temple. We also discuss alternative ways to handle your encounter with Kotaro, so you can decide what is the most fitting destiny for the big boy. Kotaro pure white flower – how to find White Pinwheel? 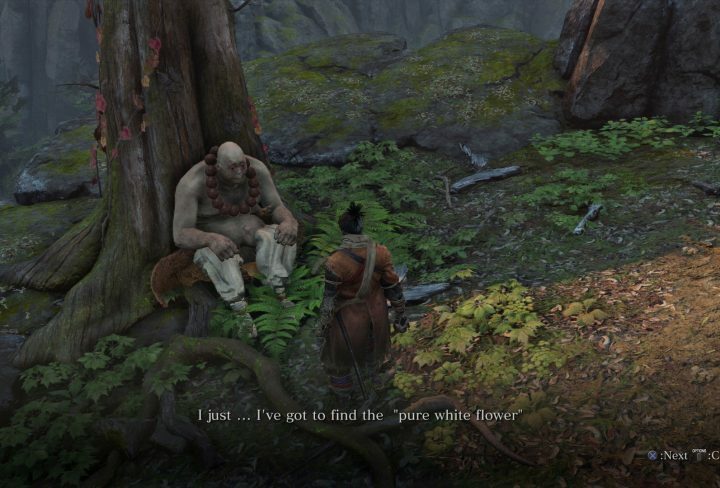 Pure white flower is found by taking a dangerous path along the ledges past the Shugendo Sculptor’s Idol. From where you find Kotaro keep going deeper into Senpou Temple area. You will come across the first big building after fighting about a dozen monks along the way. You’ll exit through a window and face a couple of tough enemies clad in straw armor. After them the only way ahead is to jump and grapple onto a branch. Going through the little passageway will lead you to Shugendo idol. Vault forward and dispose of the 4 rat enemies. There will be a ledge you can take that takes you upwards towards a wooden bridge with a mini boss. Easy way of getting to the white flower is going the opposite way from the wooden bridge. You will also find another key item needed for Kotaru. Among the idols on the ground you will find a key item called Red and White Pinwheel. Pick it up and find a ledge to your left that you can drop off of. From there you should see a small wooden pathway and then jump onto it. Walk along it until the end and way down bellow you will see yellow ledges you should be able to grab onto. Jump and keep holding square on PS4 or X on Xbox to catch the ledge. Traverse the cliffs and then climb until you reach a section you can climb by jumping from wall to wall. White flower is on the top of that jumping section as shown in the screenshot bellow. You can now go through the building behind and find another idol you can use to go back to Kotaro. Check out the Demon bell while you’re there. Pick up the red and white pinwheel then jump at the spot marked in the image. Once you drop you need to make this jump to the wooden platform. At the end of the wooden platform jump into the abyss and try catching the yellow ledge. Once you reach this crevice jump from wall to wall and on the top is the White Flower. How to Spirit away Kotaro? When you come back to Kotaro and present him with the white pinwheel he will ask you to spirit him away and to do so you will have to have a special prosthetic tool. To get this tool you will have to be a lot further into the game. I will be talking about some bosses you will meet further into the game so if you don’t want any spoilers you might want to skip the section ahead. All you need to know is that you need Divine Abduction and use it next to Kotaro. This will send him to the Inner Sanctum where you’ll finish his quest line. To get the Divine Abduction prosthetic tool you need to go to Sunken Temple region. It is reached from the Old Grave idol in Ashina Castle by going backwards from that idol and turning right across the bridge. Keep pressing forward for a very long time. In the end you will reach the Gun Fort idol. Ahead is the Long-Arm Centipede Giraffe mini boss. Defeat him and the tool is picked up at the statue in that room. Equip the prosthetic and go back to Kotaru and then pres R2/RB twice to spirit Kotaru away. Once you unlock Hall of Illusions area you will meet him there again and talk to him to finish the quest. If you help Kotaro and spirit him away he will go to the Hall of Illusions you can reach in Senpou Temple. This is a special area you will unlock if you defeat the monkeys in Senpou Temple area. Monkeys are a special boss you can reach only if you’ve beaten Genchiro boss previously. After beating Genchiro talk to Lord Kuro. 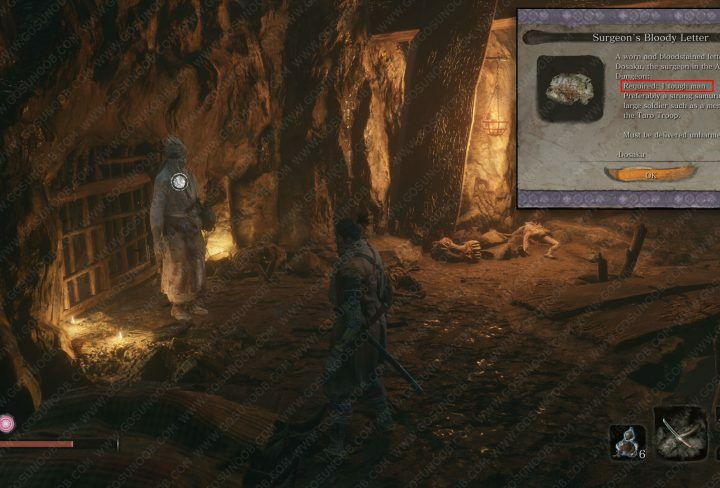 Find Isshin Ashina by doing the Rat quest. Once you find Lord Isshin Ashina you will talk to Lor Kuro again and he talks about the Mortal Blade. Once you’ve done that go to the Main Hall idol in Senpou Temple and there should be a bell on a table next to a monk sitting there. When you interact with it you will be teleported to the Hall of Illusions and the folding screen monkeys boss. After you complete this challenge you will unlock Inner Sanctum. Kotaro should show up in Hall of Illusion after you defeat the monkeys and see the cutscene. 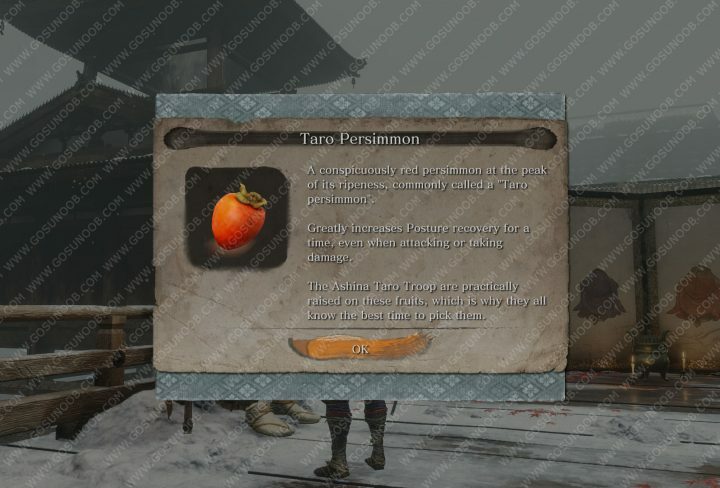 He should reward you with two Taro Persimmon items. You want the big tub of lard to suffer? Sekiro Shadows Die Twice lets you do that. You’ll have to have visited the Abandoned Dungeon first and met NPC Doujun. To reach Abandoned Dungeon you need to beat the first big boss in the game, the general on the horse, and then reach Ashina Castle. From there turn left, across the moat and cross the bridge. Go past the big guy with a bell and three dogs. Beyond them is the Abandoned Dungeon Entrance idol and the entrance into the dungeon. Go past some zombies and you should see a guy in white on the left. That is Doujun. He asks you bring him 1 tough man. Kotaro fits the description perfectly. Give Kotaro the Red and White Pinwheel. If you visited Doujun beforehand you will get a conversation option to Lure him to Abandoned Dungeon. Once you choose that you travel back to the Abandoned Dungeon Entrance. Find Doujun and you will get 3x Lump of Fat Wax, which is used for higher tier prosthetic tool upgrades. You can rest at the idol and come back to eavesdrop on a conversation Doujun has with his master. Later, when you get the diving technique, you can enter that jail cell and face Kotaro for what you did. Some NPCs in the game can be killed by the player by doing damage, but Kotaro is not one of them. You can swing your katana at him as much as you won’t, but you won’t do damage. The only way to dispose of him is to send him to Doujun in the Abandoned Dungeon. He will meet his grizzly fate there and if you visit his cell by using the diving skill you might be in for an additional surprise. Some people think that his dialogue when you first meet him means that you should kill him. This is not true. He is just sad everyone left him behind.